By David Preiser (USA) | October 22, 2011 - 6:32 pm | October 6, 2012 Bush, Gadaffi, Libya, Mark Mardell, Mark Mardell - Obam shill, PRO OBAMA AT ALL COSTS. Sorry I’m a little late in getting to this, but life intrudes occasionally. I saw this the day it was posted, but didn’t have time to deal with it until now. 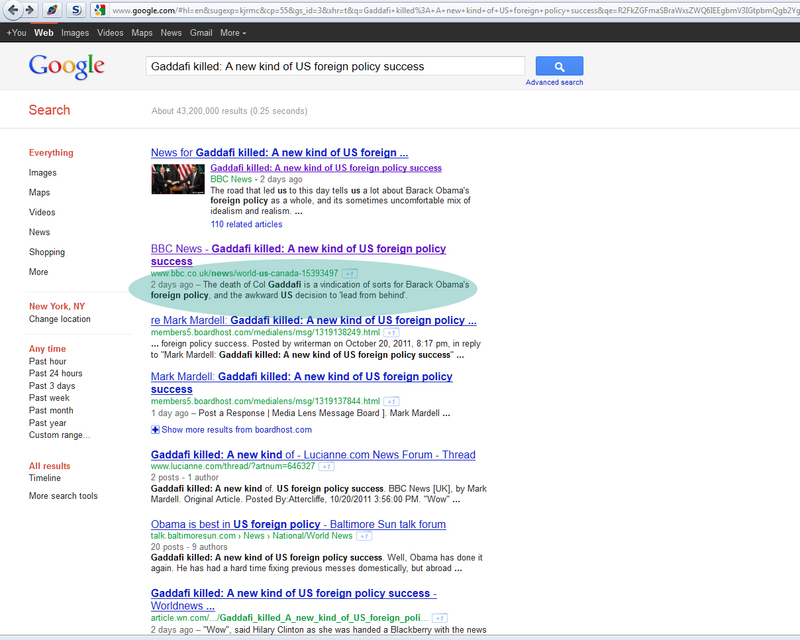 BBC US President editor blogged about Libya and the death of Gaddafi. And it’s classic Mardell in full acolyte mode. “Wow”, said Hilary Clinton as she was handed a Blackberry with the news out of Libya. Gaddafi’s death will be a relief to President Obama and his administration. That’s on the fairly simple grounds that he backed NATO action, called for him to go, and now he’s gone. The death of Col Gaddafi is a vindication of sorts for Barack Obama’s foreign policy, and the awkward US decision to ‘lead from behind’. A vindication, eh? Killing Gaddafi in cold blood, without due process of law, is vindication of a foreign policy strategy? Did the BBC ever say that when Sadaam was put on trial by his own people, judged, convicted, and sentenced by his own people, that was a vindication of Bush’s foreign policy? I forget. What color is the sky on your planet, Mark? I wonder who told him to tone it down. But make no mistake: Mardell’s true thoughts were revealed in his original words. His beloved Obamessiah has been vindicated. Was it the not doing anything part that was vindicated, or the not having boots on the ground which led to a killing in cold blood without trial or due process of law that was the vindication? Yeah, whatever. Don’t bother wondering if we had put boots on the ground that Gaddafi might have been captured and granted his human rights, put on trial, etc. Nah. The Obamessiah knows best, regardless. Has His Nobel Peace Prize been vindicated yet? FFS. In any case, let’s recall the facts. Originally, the President didn’t want to get involved at all. In fact, He had to be dragged, practically kicking and screaming, into it. (There you go again, always wanting an unapologetically aggressive America storming ahead – ed.) At the time, of course, Mardell was trying to convince you that this was “deliberating”, not dithering. We know for a fact, however, that He really was dithering, and had to have reality shoved in His face before reluctantly agreeing to act (once again, Al Jazeera beats the BBC, eh? ) In fact, Sec. of State Clinton and her Department were complaining that it was basically amateur hour at the White House, and were thinking that the lights were on but nobody was at home. It’s also important to remember that the Libyan people themselves were asking for our help, and that Mardell himself was trying to big up The Obamessiah by saying that He felt a personal connection, an emotional attachment, to the Libyans’ cry for justice. Okay, so back to the current post. Mardell explains that Gaddafi’s death will come as a relief to the President because that means the mission was a success. Naturally, what he really means is that ugly, barbaric United Statesians wanted him slotted, not that the President Himself would be so crass. But Mardell’s main point is that this represents the “Obama Doctrine”, of a less aggressive US. The fact that he has to then admit that we carried the main load of warmongering, and that the essential defeat of Gaddafi’s forces wouldn’t have been possible without US muscle is amusing, but then irritating because Mardell still maintains that it’s totally cool simply because we didn’t start it. I’ll leave it to others to explain how that makes sense, because I sure as hell can’t. Either we made it possible, or we didn’t, no? Mardell’s main point here is that it’s a significant improvement over the Bush Cowboy years because the Muslims won’t view this as the nasty US imposing our will on the poor brown-skinned folk. There won’t be a generation of Libyans growing up the name “Barack”, I guess. He still sticks to his position that the President wanted to “lead from behind”, and not that He didn’t want to do anything at all. This is White House spin, and not the facts. Let’s also recall now that Mardell himself was originally against taking action in Libya. He felt that the President frowning at Gaddafi would be sufficient, and tried to convince you that the President’s approach to this conflict was “very deliberate, very rigorous, rather academic.” It was a lie then, and it’s a lie now. The President didn’t want to do it, and had to be convinced by others to act. There’s a big difference between being unsure and trying to work it out and not wanting to do it, full stop. But Mardell constantly told you that the President was trying to figure it out anyway, and that only the uglier side of the US wanted to rush out, guns blazing. In fact, Mardell was so against the notion that the US was going to save the day that at one point he even praised the President for making the UN relevant again. This is the same UN, mind, that’s now whining about how Gaddafi didn’t get his human rights affirmed before he was whacked. Who didn’t see that coming? I won’t bother to get into a discussion about how US involvement was illegal anyway, because the President actually needed Congressional approval to send troops out in this case, where Libya wasn’t relevant to immediate US foreign policy and security needs, or that some people like St. Michael and St. Jon (Moore and Stewart) were displeased, as the BBC censored all of that. They’re both totally cool now because they support the Occupiers, so forget about old news that might make the President look bad. Mardell continues his in blog post to reassure you that it’s great because the Libyans will think they did it themselves, and didn’t have it forced on them by Western Imperialists (he doesn’t use those terms, but that’s what he means). If that’s the case – if Gaddafi’s killing in cold blood vindicates that strategy – then why was it so great for the President to dither over it for weeks? This is where it becomes clear that Mardell was spinning for Him the entire time. If the President’s plan the whole time was to bomb from afar and let the Libyans themselves do the heavy lifting on the ground, then why dither deliberate about whether or not to get involved? If “leading from behind” was the plan all along, why did He have to have His arm twisted to do it? In the end it was fear of being judged a moral failure that drove the decision. Ah, yes. He wanted to be “on the right side of history”, right? The president was told that thousands could die in a massacre in Benghazi and he wasn’t going to be held responsible for that. Hell, even the odious, now departed, Matt Frei was worrying about that before Mardell was. And Mardell is still trying to tell you that this is a success story. But if President Obama’s policy has been a success on its own terms, it leaves others in the US deeply worried. They don’t think their country should encourage, cajole, help and guide. They think it should lead – that it should be seen to lead in fact and in deed. And if it doesn’t it is not clever – it is defeatist, and will inevitably lead to a diminution of power. They may raise their voices, not today, but when the dust settles. It’s worth repeating: Forget that Sadaam was captured without harm, put on trial by his own people, and sentenced in a court of law by his own people, according to the laws of his own country. Mardell will hate that to his dying day, yet the cold-blooded killing of Gaddafi, without trail, without legal justice, is a success, a vindication, in his view. How twisted can you get? In Mardell’s biased worldview, the President’s plan was a success, even if He didn’t actually have this plan and it was forced upon Him. Cold-blooded killing is vindication, whereas a trial according to the laws of the country concerned is Cowboy justice. No effort is spared at the BBC to praise Him and prove to you that He knows best. 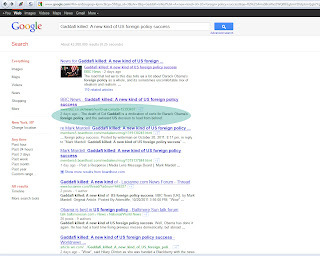 Well, I reckon he got what he deserved but how do you think the BBC is managing the coverage of Gadaffi’s bloody demise? Shall we have a public enquiry…?